There is no confusion with this boat. The boat was built 1965 by William H. Barnett Pty Ltd at McMahon's Point in Sydney to Norman George Booth. The first Southern Cross was destroyed in Sydney Harbor. Maybe Booth took sails from that boat (KA-9) and add #1 after #9 and it's KA-91, simple. (Symonette uses the same system, he takes a sail from BA-1, then adds #1 and that's Pop's John B BA-11!) Then Booth went to Naples World Championship and won the silver medal there. Not sure to be an original construction. The names of "Nangarina" and Tim Herbert are already refering to AUS-043., isn't-it any confusion or story-mix with ? Please visit http://5.5inventory.org/AUS/043/ and share your comments and notes. Originally owned by Norman Booth. Date??? Built by William Barnett in Sydney. Date??? Owned by Bill Gale. Date??? Owned by Tim Herbert. Date ??? 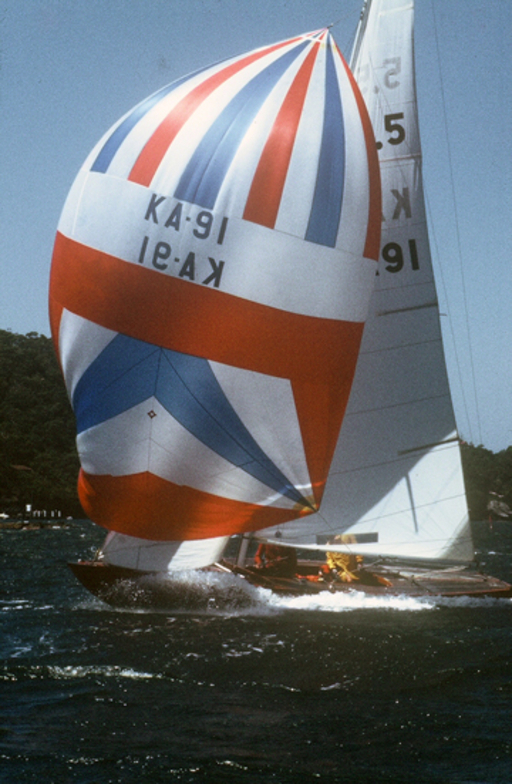 Tim Herbert later owned Nangarina.